Left: Cindy and James Hobbs, founders of the Flying J Ranch Chuckwagon Supper and Western Show. Right: Corinna Ripple offers an informal fiddle demonstration. 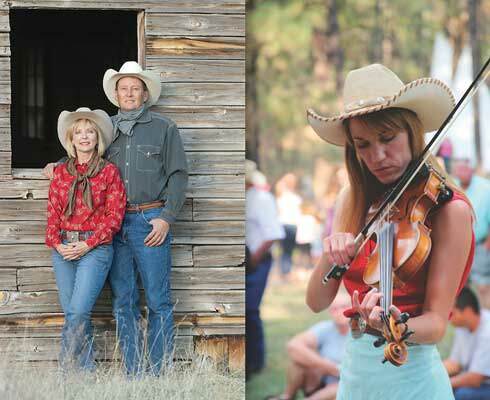 The Flying J Ranch Chuckwagon Supper and Western Show is the creation of James and Cindy Hobbs, a husband-and-wife team who founded the ranch and started and perform in the Flying J Wranglers band. James got the idea for the Flying J after working at a similar venue, the now-closed Lazy B Chuckwagon, in Estes Park, Colorado. That’s also where he met Cindy, a singer from Tennessee. The couple purchased the property here in Alto back in 1982, formed the Flying J Wranglers, and turned their undeveloped plot of land into one of the most beloved western music venues in New Mexico. I was eager to look behind the scenes of the Flying J, but I came to find out there’s really no “behind” here. It’s all one big scene. James, whose demeanor is as gentle as his voice, shows me around the Flying J Ranch property, which has been transformed into an Old West town they call Bonito City, a reference to a nearby former town that carried the name. Along the bottom of a small canyon are stores with frontier-era facades, where you can buy things like beeswax candles and jewelry. There’s a re-created blacksmith shop with an automaton named “Cowboy Bob” who gives a recorded talk about blacksmithing, and a large dining hall and stage known as the Old Barn Opera House. On the gentle slope just past those buildings is a small chapel among the pines. James isn’t sure where the hand-carved wooden pulpit inside the chapel came from—a fan, apparently, left it one day as an anonymous donation. Visitors arrive for the evening well before the show begins, and that’s OK, because the pre-show time is as much a part of the experience as the performance that will come later. 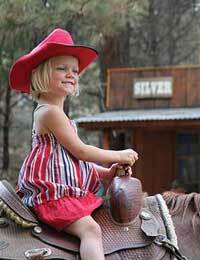 Guests roam the frontier town, shop, sit and talk. Blue jays caterwaul, and a vanguard of fireflies greets the evening. The Wranglers mingle with the crowd. Roy Black, who plays bass guitar, dons a sheriff’s badge and leads a junior deputy training school, during which youngsters agree to be kind to animals, study hard, and abide by the other tenets of the Flying J Ranch Junior Deputy Code of Honor. Corinna Ripple, the fiddler, and Randy Jones, who plays guitar, banjo, dobro, and steel guitar, demonstrate their instruments up close for curious onlookers. Greg Meeks, who plays harmonica and sometimes sings, answers questions about the pioneer wagon on display, then helps kids pan for gold in a trough set up for that purpose. Naturally, there’s a gunfight on Main Street: James and Greg, it seems, are bad guys causing trouble in town, and Sheriff Roy is there to stop them and restore justice. Or something. It’s the laughter elicited by the corniness of the show that everyone will remember, not the plotline. The Wranglers themselves also serve the food when dinner begins. It’s done “chuck wagon–style”: when it’s your table’s turn, you line up for your helping of brisket or chicken, beans, a biscuit, a foil-wrapped “tater,” applesauce, and coffee, in a tradition inspired by the traveling kitchens that have fed cowboys in cattle camps for generations. But at the Flying J Ranch, it’s not so much the food preparation techniques being re-created here—the food is cooked in a kitchen, not a field wagon—but rather the sense of togetherness that chuck wagons inspire, when hungry people gather around one of the most communal devices ever invented: the dinner table. Here, those tables are elongated to accommodate several visitors, each person seated next to someone they may not know but with whom they will soon undoubtedly discover something in common. Just as I did with the people sitting opposite me, who, it turns out, shared some of the same friends. The food is good to begin with, but something about the way it’s served, so simply, on the same kind of aluminum camping plate you’d find at a field chuck wagon, makes it taste even better. I find my biscuit especially tasty. (Fortunately, the Junior Deputy Code of Honor I swore to earlier doesn’t say anything about gluttony.) During dinner, the Wranglers float around making sure everyone has what they need. At least a few newcomers in the audience each evening must be surprised when the same person who just refilled their iced tea walks onto the stage moments later and picks up an instrument to play. “That’s the secret of the whole business,” Cindy confides in me. “There’s no wall between the audience and the performers." As nourishing as the meal is, the music is twice so. The Wranglers play a number of instruments—guitar, fiddle, and bass—and they all sing, seasoning the music with just enough twang that you don’t forget where you are. The vocals are beautiful—pure and unadorned, as if the mountains themselves were harmonizing. For an hour, the Wranglers sing original songs and old standards—“Ghost Riders in the Sky” is here, of course, and several others that are familiar in theme if not in melody. The lyrics speak of riding dusty trails and feeling a kinship with the land, and of all the hard work still to be done before the day is over. Even if you don’t mend fenceposts for a living, or punch anything other than a time card, the sentiments still feel relevant. Dusty trails come in many forms. The Wranglers are true performers, each a talented musician and singer. And they’re as much fun to watch as they are to listen to. When Corinna solos on “Orange Blossom Special,” her fingers dance across the fiddle strings in a choreography that enthralls. The joy the Wranglers take in performing shows on their faces. And there’s yodeling. Oh, yes, yodeling. This is Cindy Hobbs’s forte—despite being self-taught, she won the Western Music Association’s national yodeling contest in 1990. It’s clear why. In the short three minutes it takes her to convince the audience to “Yodel Your Troubles Away,” Cindy jumps vocal registers so rapidly and often that the other Wranglers are inspired to cool her down by fanning her with their cowboy hats. After the performance, people who weren’t friends coming in are friends going out. Many carry souvenir dinner plates they bought in the store. The Wranglers make themselves available, signing autographs and answering questions. Because of the closeness they show onstage, one of the most common questions is: Are they family? They aren’t, but they still enjoy being asked. Contributor David Pike writes about small-town New Mexico. He is the author of Roadside New Mexico: A Guide to Historic Markers (UNM Press).